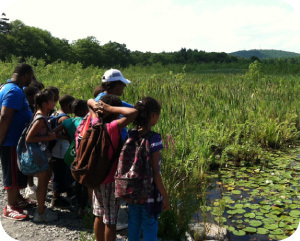 The YMCA of Greater Boston is once again partnering with Boston Public Schools (BPS) and Boston Afterschool and Beyond to present the Summer Learning Project (SLP) at our Ponkapoag Outdoor Center. For the third consecutive season, between 60 and 80 students from partnering schools will engage in an innovative twist on academic summer learning and enrichment. For five weeks "Stampers" (Student Campers) engage in three hours of English Language, Arts and Math instruction every day. For the remainder of each day they engage in all the typical fun camp activities that invite exploration, get the heart pumping, and encourage leadership. Our school partners include Medell Elementary, Winthrop Elementary, E. Greenwood Leadership Academy, the Everett, and Trotter Elementary Schools. For the next two summers, our cohort is involved in a national study being conducted by Rand Corporation - a random control trial that will follow this year's third graders, chosen by lottery, through this summer and next. Research shows that engaging summer learning experiences can help to reduce summer learning loss and close the achievement gap for at-risk populations. The Y is grateful to the funders for this innovative summer program: Opportunity Agenda, Wallace Foundation, and BPS. Victor has been a delegate in the Wang Y's Youth In Government program for the past three years. When he first joined the program, Victor had a hard time finding his voice. But after meeting the staff and other teens in the program, Victor soon excelled at debating potential legislation in the State House Senate, serving as Senator for our delegation. Youth In Government helped Victor gain more confidence in his abilities to lead others. During his second and third years, Victor became a Committee Chair and spent his time helping other delegates succeed in their arguments. 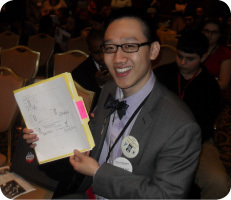 He became the only delegate in the 2013 Model Government Conference to successfully override the Youth Governor's veto of his bill, and he won one of the most prestigious awards in the program, the Benedict-Winch Core Values Award. Victor is finishing his senior year and headed to college in the fall. He plans to enter public service after he completes his studies in Political Science. The Alliance of Massachusetts YMCAs, representing all 31 Ys in Massachusetts, has been selected to participate in the Y's Statewide Pioneering Healthier Communities (PHC) - an initiative aimed at addressing the childhood obesity epidemic through policy, systems and environmental change. The Alliance of Massachusetts YMCAs is one of 14 to receive funds from YMCA of the USA, which was recently awarded nearly $7.9 million over two years from the Robert Wood Johnson Foundation (RWJF) to expand the Statewide PHC initiative from six states to a total of 21 states. The YMCA of Greater Boston is the largest YMCA Association in the state and is a founding member of the Alliance of Massachusetts YMCAs. 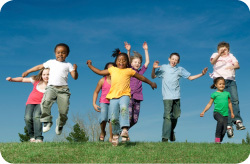 Launched in 2009 with a $6.8 million grant from the RWJF, Statewide PHC addresses the childhood obesity epidemic through policy and environmental changes at the community and state level. Through Statewide PHC, the Y convenes state and community leaders to work together to implement strategies that support healthy living. "The Y is really good at energizing communities and empowering them to tackle comprehensive policy approaches," said John Govea, JD, MPA, senior program officer at RWJF. "As we all strive to reverse childhood obesity by 2015, the Y's collaborative approach, which helps turn local innovations into statewide efforts, will be critical." Forty future NBA and WNBA stars from the Burbank, Waltham and West Roxbury Ys attended a basketball clinic last month with Celtics point guard Avery Bradley sponsored by the Boston Celtics and Dunkin Donuts at the Celtics training facility in Waltham. During the clinic, Bradley led the kids, ages 8-13, in basic practice drills such as free throws and lay-ups while emphasizing basketball fundamentals. Afterwards, Bradley participated in a Q&A session with the kids, emceed by former Celtics player Dana Barros. 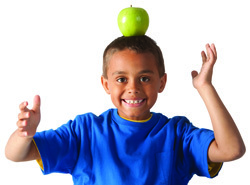 Join us on Saturday, April 27 forHealthy Kids Day, our annual event to get kids moving and learning, and families living healthier as part of the Y's national initiative to improve the health and well-being of families. Our Y events feature fun active play and educational activities that inspire kids to carry a spirit of excitement and exploration. Kids can also enter a coloring contest for a chance to win a free three-month Y membership. Bring the whole family and come dressed to play! Visit our website for branch schedules and more information. John Conley, Partner with Gilliam Capital LLC, has been a member of the General Board since 2001 and was Chair from 2009 to 2012. He was recently elected to the YMCA of the USA Board of Directors. Long, long ago as a high school student I worked as a membership checker at the Y in my Connecticut hometown. When I moved to Boston in 1985 I lived very near the Huntington Avenue branch and would play on its one squash court. How has the Y influenced your life? 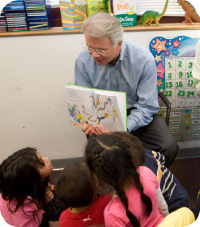 Through my time as a Y board member, I've been able to steward this remarkable institution for more than a decade as it provides a range of vital services to a wide breadth of people in the Greater Boston area. What is one of the greatest impacts the Y has on the Greater Boston community? Where to start? Perhaps it's the delivery of a common, reliable set of programs and services to our constituents no matter where they live, or how much they earn, or what their background is. Name another organization that can claim the same. The participation of these community leaders reflects their strong commitment to the youth of Greater Boston. On October 23, 2013, hundreds of Boston leaders will come together to support the YMCA and our work to help thousands of Boston-area youth set and achieve high aspirations for their future. For more information about the event or to learn how you can get involved, please contact Kathryn Davids. Washington, Will Morales, Phil Hillman, and Lydia Greene. 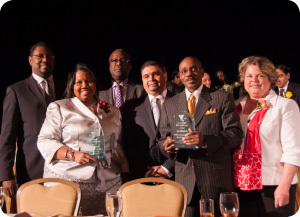 Over 370 people attended the 38th Annual YMCA Achievers Recognition Dinner last month at the Marriott Copley Hotel. The evening celebrated the accomplishments of the adult Achiever Class of 2012, who contributed more than 1,600 hours of volunteer service to the community. The event also introduced the incoming Class of 2013, who were nominated by their peers and supervisors at their places of employment. Big thanks to our corporate partners: Raytheon Company, Liberty Mutual, Partners Health Care, State Street Corporation, Tufts Health Plan, TJX, Harvard Vanguard Medical Associates, Harvard Pilgrim Health Care, MIT, and Dana Farber Cancer Institute. The event raised nearly $135,000 to support youth programs that prepare and motivate teens to enter college ready to succeed. For more information about how you can get involved with the YMCA Achievers program, please contact Will Morales, Executive Director.